Other Worlds Austin is a dedicated science fiction film festival based in Austin, TX. A team of passionate scifi film makers, writers, and fans, they put together a curated collection of independent and classic science fiction movies, with a little horror thrown in. This was my first year to attend, and I am definitely part of the cult now. I liked almost everything I saw this year, which is not a common experience at most festivals. The curation was films was very well done. They brought in some cool people, like Brian Narelle, who played Lt. Doolittle in Dark Star (1974) and has some of the weirdest stories about film making and fandom. There was a fascinating script writing class by Matt Lohr on Dan O’Bannon’s screen writing style, that dissected the original Alien to examine why it’s such a damn good movie. Other Worlds is a great little festival, and I can’t wait to see what they put together next year. OMG, I’m a Robot! – a quirky Israeli comedy with robots and ridiculous giant guns. Lots of fun, probably hard to find. U.S. premier at the festival. The Axe Murders of Villisca – creepy, very creepy. The Villisca murders were a real historical event, and the house is supposedly haunted. The film makers explore what happens when bored teenagers break into the house one night. Blood Hunters – A cool concept, but my least favorite thing at the festival. Dark Star (1974) – The classic film school project by John Carpenter and Dan O’Bannon that launched their careers. We Go On – One of my favorites, this unique ghost story puts plenty of ghost movie tropes in a blender and creates an interesting story that tackles some heavy philosophical questions. Bed of the Dead – As ridiculous as the title suggests. This weird little horror film came about in an effort to save money and film a movie almost entirely in one room. The constraint pays off, the movie is suspenseful, a good balance of gore to jump scares, with a few mysteries that keep the audience interested. Stille Reserven – Gorgeous, disturbing German about a dystopian future where our corporate masters have figured out how to stop people from escaping their debts even in death. Also a favorite. Island of Lost Souls (1932) – One of the best horror films of the 1930’s, but Paramount didn’t spend the money on a musical score, or even basic sound effects. Composer Jay Woelfel decided to fix that, composing, recording and editing an entire soundtrack that fills that gap in the emotional effects of the film. Good stuff. The Unseen – A cool, weird twist on the idea of the Invisible Man. This is a film worth seeing. Other Worlds Austin Film Festival Starts Tonight! 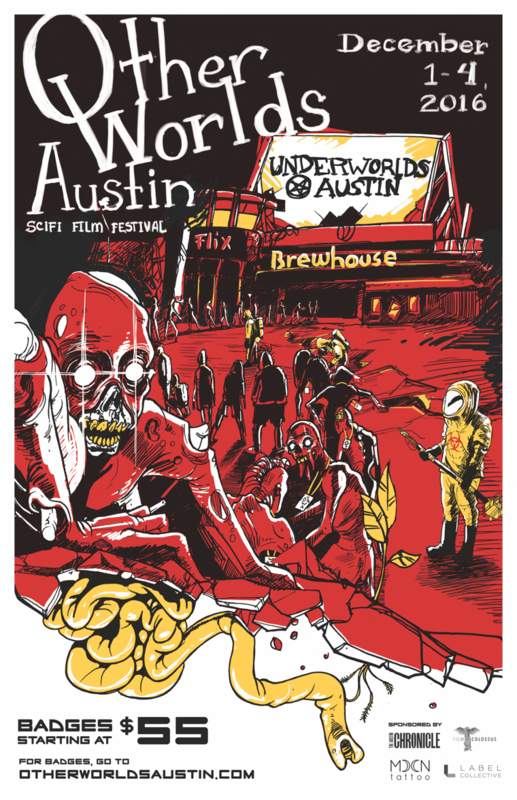 We’re about to make the drive up to Round Rock for a weekend of scifi and horror films at Flix Brewhouse, courtesy of the Other Worlds Austin film festival, home of the Mary Shelley award. Tonight we’re going to see the opening film, OMG, I’m a Robot!, and hopefully get into The Axe Murders of Villisca, written by Austin local Owen Egerton. The email announcements have been making big promises of a party tonight that features excessive amounts of chips and queso and chicken tenders. Ah, Round Rock, whirling vortex of Central Texas culture. Friday has arrived, with the swiftness of a desert tortoise crossing a state highway. Here is your recommended reading for the weekend. Mars. Scientists on the space station exposed two types of Antarctic microbes to simulated Mars-like conditions, and found that they’d probably survive if introduced to Mars. Science Fiction. Some lovely people are making a documentary about science fiction legend Ursula K. Le Guin. The National Endowment for the Arts has awarded them some funds, but won’t pony it up until the rest of the production costs are raised. So, Kickstarter to the rescue, of course. China on the Moon. In 2013, China sent a lander to the Moon, and took some stunning pictures with modern cameras. They also discovered a new kind of Moon rock. National Geographic has a nice gallery of the images. Pandemic. You may have heard recently of the Zika virus, a mosquito-born illness that might be causing a birth defect called microcephaly (small heads and brain damage), at high rates in babies born in Brazil. The link between Zika and these high rates of birth defects is not conclusive, but there is definitely something going on in Brazil. Only in Texas. That said, the Zika virus has now appeared in the US, but not through mosquito transmission. Texas has the honor of having the third known case in the world of sexually transmitted Zika virus, because of course we do. Cute and Deadly. On a lighter note, oh my gods I need all of these incredible vinyl toys from Shinbone Creative in their Thimblestump Hollow collection. They’re cute and terrifying, with deep, adorable eyes that could easily draw you down into a sweet, sappy doom of being disemboweled and eaten alive. Time and Dark Matter. According to Frank Wilczek, a Nobel Prize-winning physicist at the Massachusetts Institute of Technology, the nature of Time probably has something to do with dark matter. I read this article three times before I really wrapped my head around the idea he’s getting at. It’s a great think piece, and my head’s spinning with the possible implications for time travel fiction. Humans are less special. A recent experiment indicates that ravens have a form of empathy, in that they can imagine another creature’s point of view. Horror. Have you heard about the upcoming horror movie Ava’s Possessions? No? How about Spirit Possessions Anonymous? Learn how SPA can help you with your demons in the video below, then go watch the teaser trailer.